Geinsa has planned, manufactured and recently installed painting equipment for the firm, Abba, specialised in finishes, and high quality metal and plastic coating. 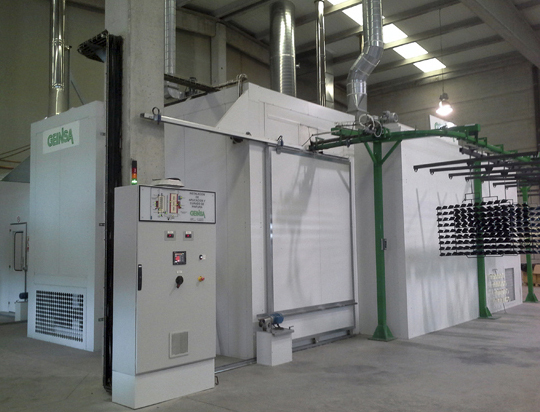 The installation is comprised of a liquid paint application booth and a polymerisation oven, equipped with an overhead manual part transport system. The booth has been planned to have two application positions that will be independent or simultaneous depending on the type of part to be treated. There is also a part storage circuit (buffer) prior to the drying oven or to apply a second layer of paint. The oven doors are motor-driven and controlled by the programmable robot (PLC). The control box has a touch screen which facilitates process control and programming tasks. The whole installation has been carried out with a fairing outside the booth and oven to obtain a clean work atmosphere.